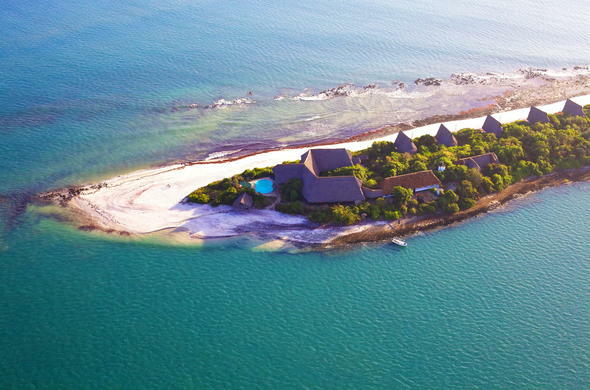 Lazy Lagoon lies in the Zanzibar Channel in Tanzania offshore from mainland Bagamoyo, boasting 9km of deserted beach. Lazy Lagoon can be reached by road from Dar es Salaam, a trip of just under an hour. This is followed by a short motor boat trip across the 2km stretch of sea to reach the island. Alternatively, a charter flight from Dar es Salaam will land at a private airstrip from where it is a 20 minute boat ride to the island. Undertake a relaxing dhow safari; a trip around the Lagoon the traditional Swahili way -in a locally made 'Ngalawa' or make use of the kayak canoes, which are ideal for a more leisurely paddle. Location of Lazy Lagoon Island. Lazy Lagoon also boasts a natural reserve that has mangrove trees, patches of indigenous forest and is home to many small mammals.